I love fall and winter colors and in the summer I was dying to wear dark and earthy colors. 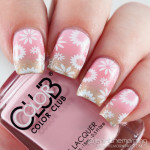 Lately I have been chomping at the bit to wear lighter and brighter: my nails are ready for spring! I had some birthday money burning a hole in my pocket and the colors I picked out at Ulta and Sallys were decidedly springy. As an aside, I also picked up ORLY Nailtrition as I have been noticing some minor peeling and starting with this mani, I am using it as a base coat to strengthen my nails up a bit. I wanted to use this turquoise and light coral together so I decided to do a skittlette mani. I started off with painting 2 coats of China Glaze – For Audrey on my pointer, 2 coats of ORLY – Cotton Candy on my middle and ring finger and finally 3 coats of Sephora X – In Like on my pinky. As an aside, I picked up this Sephora X at Big Lots for $2.50. 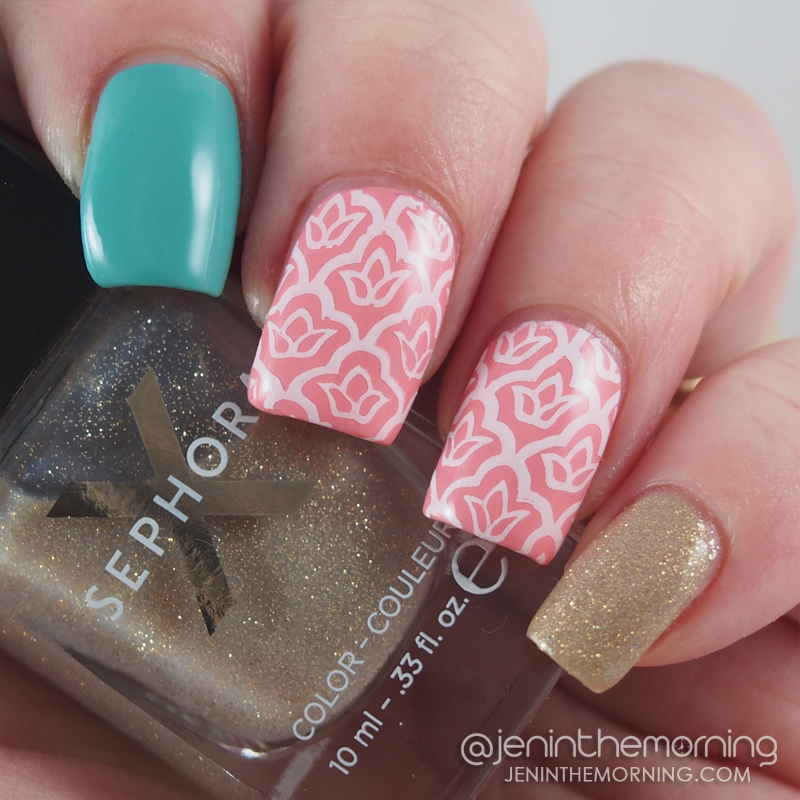 It is a taupe jelly packed with gold glitter and I absolutely love it. 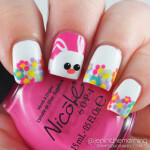 I put top coat over everythind and once it was dried, I stamped over Cotton Candy with Funky Fingers – Gesso. I loved this manicure. It was fresh and I am totally drawn to these colors! I won’t say I am done with more wintry tones of color yet, but don’t be surprised to see more light and bright on my nails!